AFC Bournemouth U21s created chances aplenty but were beaten by a more clinical Brentford U21s 3-0 on Friday. The Bees opened the scoring early on when Ali Coote dispossessed Nnamdi Ofoborh inside the 18-yard box before placing into the far corner with his left just three minutes in. An instant response was almost on the cards from the Cherries as Oforbh threaded through Jaidon Anthony, whose well-placed shot found the back of the net, only for the number ten to be flagged offside. 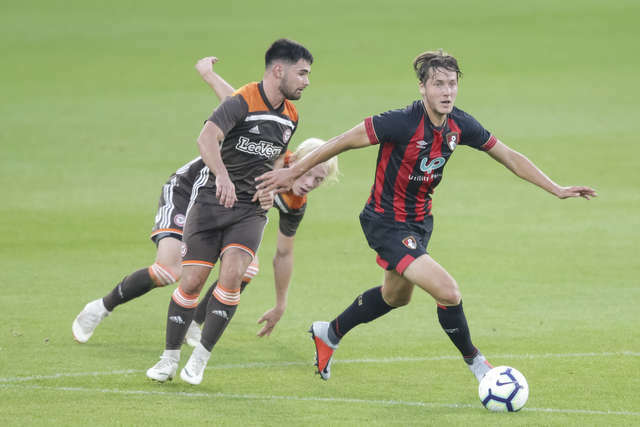 Charlie Seaman came close for Bournemouth moments later with a long-range free-kick sailing just over the bar, before Ofoborh wriggled through the Brentford defence only to be denied by Patrik Gunnarsson narrowing the angle. The home side, unable to make their dominance in possession count, were put on the back foot again 25 minutes in, with shots from Joe Hardy and Reece Cole being dealt with by Jordon Holmes and Corey Jordan respectively. The final chances of the first half fell to Alex Dobre whose left footed strike went wide of the post, and Seaman whose close-range attempt was too close to the goalkeeper. The Cherries showed promise in the early knockings of the second half, Keelan O’Connell coming close with a half-volley that the keeper parried well, while the resulting corner was blasted over by Jordan. But Brentford added to their lead on the hour mark after Jaako Oksanen’s corner found the head of Hardy, whose flicked effort went beyond the reach of Holmes for 2-0. Carl Fletcher introduced three substitutions in an effort to change the Cherries’ fortunes, Shaun Hobson, James Boote and Trialist coming on for Sam Sherring, Frank Vincent and Jaidon Anthony. Corey Jordan was then forced off through injury, replaced by Gavin Kilkenny. Brentford added insult to injury on the 80th minute when a cross from Nikolaj Kirk was unluckily put into the back of the net courtesy of Ryan Glover’s attempted clearance. He was shortly replaced by Tom Hanfrey in Bournemouth’s final change of the game. The away side held on for the final ten minutes to come away with the win.